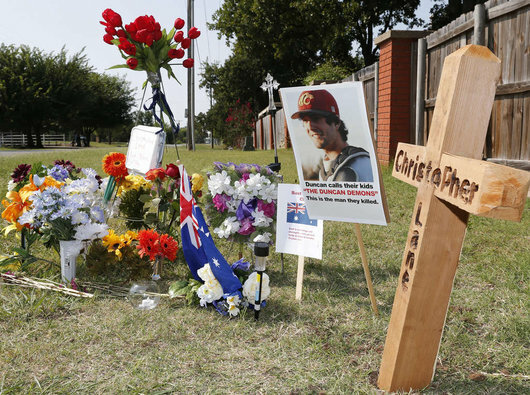 The story of three “bored” teens gunning down 22 year-old Australian baseball player Chris Lane as he jogged in Duncan, Oklahoma this week has once again sparked debate along the well-rutted roads of gun control and race relations, even though only two of the three teens involved were black. While guns and race remain thorny issues worthy of debate, this particular story draws light on another issue that should trouble any who hope to see America’s future shine as brightly as her past. In America’s creation myth as Ronald Reagan’s proud “City on the Hill”, never once did we doubt which side we were on in the binary world of “Good guy versus Bad guy”. Well, ask yourself, how does the nullity of Chris Lane’s killing fit with that myth and its future application? Yes, testosterone and idle time have long been a dangerous combination. Just watch a ten year-old boy with a magnifying glass on a hot summer’s day and a colony of ants marching along the sidewalk to underscore the point. And you wouldn’t have wanted to be a cooing pigeon in our neighborhood in the late `50’s, not with every kid sporting a BB-rifle. But for ants and pigeons to be replaced by a human being in idle disregard requires a shredding of the societal fabric that previously only war could so thoroughly tear asunder. I recall my father telling me of his escape from a German POW camp in January 1945, after which he and his buddy headed east toward Russia, because that’s where they was most likely to find an American mission. During his journey from Germany through Poland Pop witnessed many horrors of war, from the mass-scale devastation wrought by the Warsaw Uprising to the poignant tale of an old Polish man who every day around 5 p.m. would go out to the highway which ran east and west along the airport in front of his house. The neighbor explained that the old man’s only daughter had been taken by the Germans and driven away to the west on that highway three years before. Every night since then he would go up there, and wait for his daughter to return home. Just wait, because it was all he could do. So the Russian took the rifle, and as they were driving along saw a man walking along the side of the road. And without a moment’s hesitation he brought the rifle to his shoulder, and Pow!, shot the man dead in his tracks. As cleanly as he could describe it that was what war did to men, turned them into animals with nothing but the thought of where their next meal would come as a concern. You had to break down a man’s sense of humanity in order to get him to kill. But today we see that same war-like insensitivity in Duncan, Oklahoma via three dehumanized American teens whose lives have become so devoid of empathy that killing for sport out of simple boredom no longer registers on their moral compass. I’ve run in troubled places before on my travels. Run in an unwitting, naïve manner out along darkened, at times desolate streets, only to learn upon my safe return to a hotel that I’d run into a hostile environment where my safety could well have been compromised. But we runners, by nature, feel a false sense of security within our contained bubble of effort, an invincibility. Never a threat, never a target, we are instead a constantly moving presence never lingering long enough to be known. Here, then gone, like a new-age drifter in the Old West. While we warn our women to be careful where they run, because predators lurk, rarely do men put such doubts in our own minds. No more. The disintegration of community — just as easily reflected in the polarized politics of Washington D.C. — has put us all in harm’s way. And while many are choosing to view this incident from along the racial divide, it goes much deeper than that long, lingering wound. Kris Kristofferson famously wrote in Me and Bobby MCGee, “Freedom’s just another word for nothing left to lose.” But here in the 21st century it seems America’s version of freedom may just be another word for nothing left, period. Let’s hope it isn’t so. This is such a sad story, how can boredom be an excuse for such callous behaviour? You’re right, there something fundamentally wrong with society!!!! Toni – Given the history of proud vets like your Dad’s, the beating death of 88 year-old WWII vet Delbert Belton this week at least matches, if not exceeds, the senselessness of Chris Lane’s murder. We like to console ourselves thinking there is a very “cold corner of hell” for the perpetrators, but even that seems unsuited to the crimes. Yes, the killing of Mr. Belton is just another sad reminder of how atomized and callous this society has become. The sense of Union now seems like a relic from another time.